President Donald Trump said during an appearance in New York last week that Puerto Rico was "absolutely obliterated" and in "very tough shape"
Gov. Cuomo, Jennifer Lopez and local leaders urged people to help Puerto Rico, which was devastated by Hurricane Maria. Ida Siegal reports. The U.S. ramped up its response Monday to the humanitarian crisis in Puerto Rico, even as President Donald Trump brought up the island's struggles before Hurricane Maria struck — including "billions of dollars" in debt to "Wall Street and the banks which, sadly, must be dealt with." The Trump administration has tried to blunt criticism that its response to Hurricane Maria has fallen short of its efforts in Texas and Florida after the recent hurricanes there. Five days after the Category 4 storm slammed into Puerto Rico, many of the more than 3.4 million U.S. citizens in the territory were still without adequate food, water and fuel. Flights off the island were infrequent, communications were spotty and roads were clogged with debris. 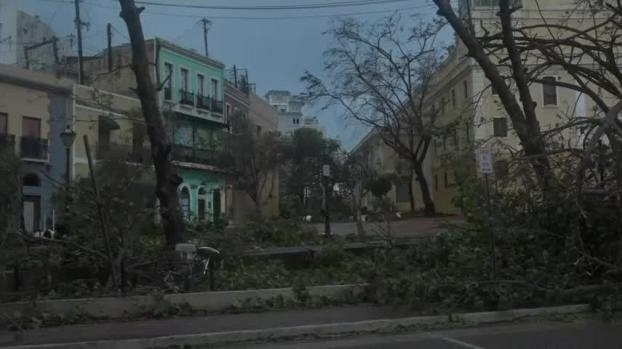 Officials said electrical power may not be fully restored for more than a month. Trump himself pointed out some differences between the two states and the island in a series of tweets Monday night. "Texas & Florida are doing great but Puerto Rico, which was already suffering from broken infrastructure & massive debt, is in deep trouble." Trump also noted that the island's electrical grid was already "in terrible shape." Still, he promised, "Food, water and medical are top priorities - and doing well." In Washington, officials said no armada of U.S. Navy ships was headed to the island because supplies could be carried in more efficiently by plane. The Trump administration ruled out temporarily setting aside federal restrictions on foreign ships' transportation of cargo, saying it wasn't needed. The government had waived those rules in Florida and Texas until last week. Though the administration said the focus on aid was strong, when two Cabinet secretaries spoke at a conference on another subject — including Energy Secretary Rick Perry, whose agency is helping restore the island's power — neither made any mention of Puerto Rico or Hurricane Maria. Democratic lawmakers with large Puerto Rican constituencies back on the mainland characterized the response so far as too little and too slow. The confirmed toll from Maria jumped to at least 49 on Monday, including 16 dead in Puerto Rico. "Puerto Ricans are Americans," said Rep. Nydia Velazquez, D-N.Y., who traveled to Puerto Rico over the weekend to assess the damage. "We cannot and will not turn our backs on them." Trump himself was expected at the end of last week to visit Puerto Rico and the U.S. Virgin Islands, after they had been ravaged by Hurricane Irma. But the trip was delayed after Maria set its sights on the islands. The head of the Federal Emergency Management Agency, Brock Long, and White House homeland security adviser Tom Bossert landed in San Juan on Monday, appearing with Puerto Rico Gov. Ricardo Rossello at a brief news briefing. 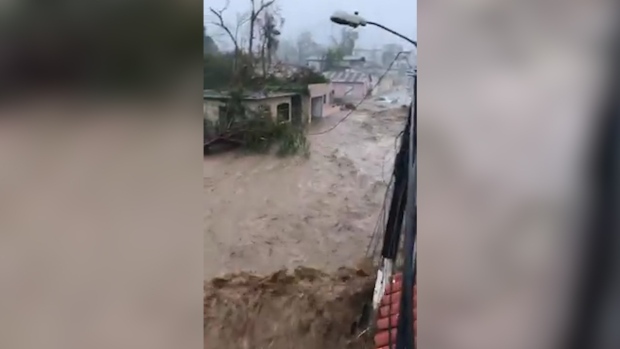 Though Rossello had urgently called for more emergency assistance over the weekend, he expressed his gratitude for the help so far. The governor said the presence of Long and Bossert was "a clear indication that the administration is committed with Puerto Rico's recovery process." Long said, "We've got a lot of work to do. We realize that." Perry and Interior Secretary Ryan Zinke made no mention of Puerto Rico or the hurricane during a joint appearance before the National Petroleum Council, a business-friendly federal advisory committee. News reporters were not allowed to ask questions. Perry had traveled with Trump to Texas and Florida following hurricanes Harvey and Irma. Energy Department crews are working in Puerto Rico and the Virgin Islands, coordinating with the Puerto Rico Electric Power Authority, FEMA and a team from the New York Power Authority, among others. An eight-member team from the Western Area Power Authority, an Energy Department agency, assisted with initial damage assessments in Puerto Rico and has been redeployed to St. Thomas. A spokeswoman said additional responders would go to Puerto Rico as soon as transportation to the hurricane-ravaged island could be arranged. Zinke's department oversees the U.S. Virgin Islands, along with other territories. The federal response to Maria faces obvious logistical challenges beyond those in Texas or Florida. Supplies must be delivered by air or sea, rather than with convoys of trucks. FEMA said it had more than 700 staff on the ground in Puerto Rico and the U.S. Virgin Islands. 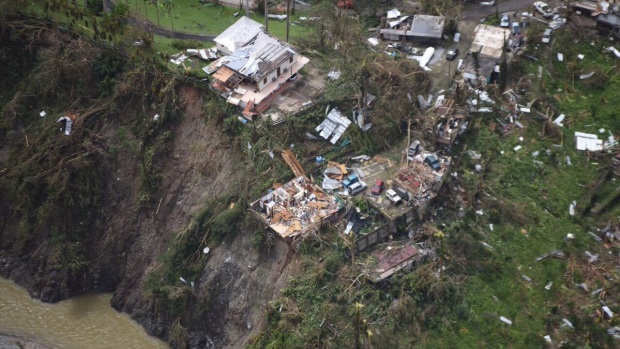 They were helping coordinate a federal response that now includes more than 10,000 federal personnel spread across the two Caribbean archipelagos. In Puerto Rico, federal workers supplied diesel to fuel generators at hospitals and delivered desperately needed food and water to hard-hit communities across the island. 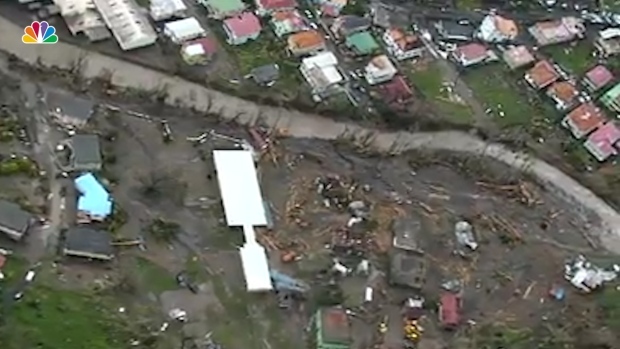 Cargo flights are bringing in additional supplies, and barges loaded with more goods are starting to arrive in the island's ports. San Juan's international airport handled nearly 100 arrivals and departures on Sunday, including military and relief operations, according to the Federal Aviation Administration. The Pentagon dispatched the Navy amphibious assault ship USS Kearsarge, which provided helicopters and Marines to help with the relief effort onshore. However, the Trump administration said Monday it would not waive federal restrictions on foreign ships' transportation of cargo as it had following Harvey and Irma. The administration said it will continue to enforce the Jones Act, which requires that goods transported between U.S. ports be carried on U.S.-flagged ships. Department of Homeland Security spokesman David Lapan said the agency had concluded there were already enough US-flagged vessels available. On Capitol Hill, congressional leaders were talking about how to pay for it all. Puerto Rico was already struggling from steep financial and economic challenges before Maria made landfall. Last year, House Speaker Paul Ryan and Democratic leader Nancy Pelosi joined with President Barack Obama to help recession-ravaged Puerto Rico deal with its debt crisis. After the devastating storm, Puerto Ricans will now be eligible to benefit from the same pots of federal emergency disaster aid and rebuilding funds available to residents in Texas and Florida. Lawmakers approved a $15 billion hurricane relief packaged after Harvey hit Texas, but billions more will likely now be needed to respond to Maria. Ryan said Monday that Congress will ensure the people of Puerto Rico "have what they need."